The Spirit Who Loves Surprises is one of the Yoshi Island Spirits in the game Yoshi Topsy-Turvy. The Spirit Who Loves Surprises introducing himself to Yoshi. After the great spirit Hongo locks away Yoshi's Island in the Forbidden Pop-Up Book to stop Bowser rampaging, he fired his assistant the Spirit Who Loves Surprises for speaking against the action. The spirit soon finds Yoshi, an inhabitant of the island. Yoshi becomes mad as soon as he finds out that Hongo trapped the island, and the Spirit Who Loves Surprises apologizes, saying that "We spirits have power, but just not enough of it, I guess. We could not just lock Bowser away, I'm so sorry." He asks Yoshi to travel to the last page of the Pop-Up book where Bowser resides. The Spirit Who Loves Surprises suggests that if Yoshi is able to defeat Bowser, the great spirit Hongo may free the island from the Pop-Up Book. Yoshi still appears to be mad, so as proof of his apology, the Spirit Who Loves Surprises gives him a special power which allows him to tilt the entire island using the force of gravity. Yoshi is encouraged to tilt a boulder to test his new power, but he accidentally hits the Spirit Who Loves Surprises and he goes flying into the distance. He yells out "Yes, that's it. That's how you use the power!". Yoshi then begins his journey to the last page of the book. The Spirit Who Loves Surprises during the ending cut-scene, when he returns with Hongo. On the way, Yoshi meets several other spirits who assign him a certain task in order to allow him to progress to the next page. After each mission, there is a Bonus Chance!. If he wins the Bonus Chance!, Yoshi must play a Bonus Mission! that the Spirit Who Loves Surprises hosts. If he wins, Yoshi will gain 50 coins. After completing the chapter Tale of the Spirit of Kindness, Yoshi progresses through a level under the eye of Bowser, who harms Yoshi with fireballs is he is to slow down. It is revealed at the end of the level that this Bowser is a cardboard fake being controlled by the Spirit Who Loves Surprises. Afterwards, he apologizes to Yoshi for frightening him, and he was just seeing how much Yoshi has improved at tilting things. Yoshi still appears mad with him, and the spirit tells him that he still has a long way to go if he is to reach the last page of the book. In The Tale of Bowser's Cave, before Yoshi faces Bowser, the Spirit Who Loves Surprises congratulates him on making it this far. He then says "Bowser is just up ahead! In that cave! I know it!". Yoshi then goes forth for the battle. After defeating Bowser, the spirits celebrate Yoshi's victory in locking the villain away, and they thank him will all their hearts. Hongo is very grateful for Yoshi's heroism, and he returns Yoshi's Island back to normal. And fortunately, the Spirit Who Loves Surprises is allowed to return with Hongo. The Spirit Who Loves Surprises appears as a Novice-class support spirit in Super Smash Bros. Ultimate. When equipped, it boosts the player's PSI attacks. In World of Light, the spirit is located north-east on the Light Realm map. To obtain it, the player has to fight four pink Yoshis on the Super Happy Tree stage. The Spirit Who Loves Surprises puppeting a cardboard Bowser. The Spirit Who Loves Surprises dresses in a similar to a clown or jester. He wears clothing which has a striped pattern on the sleeves, yellow gloves, two large, blue buttons on his chest and a pink spot which surrounds his right eye. He has a large, red nose and white and red makeup around his lips. He also has two striped pink and purple horns on his head. He is capable of floating. The spirit can often be seen giggling. As his name implies, the Spirit Who Loves Surprises is fond of surprising other people. He is kind hearted, as he feels sorry for Yoshi having his home trapped. He also does not appear very assertive, as he was not able to talk Hongo out of trapping the island, which he is remorseful for. 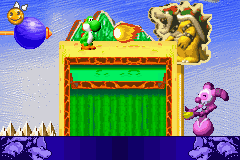 Generosity is evident, as he gives Yoshi the power to tilt the entire world at the beginning of the game. The spirit compliments Yoshi on getting better at tilting things, showing his encouragement to reach the last page of the book. He also feels the need to test if Yoshi is "ready", as he puppets a cardboard Bowser to test Yoshi's skills. "I am the tiny book spirit, a spirit who loves surprises." "I did not wish for the whole island to be entrapped like this. But no one can stop Hongo one he makes up his mind. As you can see, I was fired for opening up my big mouth." "We spirits have power, but not enough of it, I guess. We could not just lock Bowser away. I'm so sorry." "Then again, if you can get to the last page in this book... And you find a way to lock Bowser away... Then maybe Hongo will think about changing his mind... He might just let your little island out of the book!" "Other spirits are guarding the other pages of this book. If you want to turn the page, listen to what the spirits say. Then show them what you can do!" "There are six spirits in all. If you convince all of them... they'll let you go to the final page, where Bowser waits." "Hey, don't be so mad! As proof of my apology... I'll give you a truly amazing treasure! I'll give you the power to tilt this entire world! Look! See! Try it! "Yes, that's it. That's how you use the power!" "Sorry to frighten you! It's me! Me, remember? Uh-huh! You've gotten a lot better at tilting things....................Are you...mad?" "Awwww! Come on now! Don't be so angry! You still have a long way to go to reach the last page. Good luck!" "Well done! I knew that you could do it. Look! Bowser is just up ahead! In that cave! I know it!" Standard sprite when talking to Yoshi. Sprite of the spirit shrugging his shoulders when upset. Sprite shown when the spirit tells Yoshi about when he got fired by Hongo. Sprite shown when the spirit gets sent flying by the boulder. Standard platformer sprite of the spirit. The spirit shrugging his shoulders during a platformer. The spirit puppeting a cardboard Bowser. The spirit apologizing to Yoshi for trapping his island. The spirit teaching Yoshi how to use Gravity. Yoshi accidentally sending the spirit flying after using Gravity. The spirit hosting a Bonus Mission!. After clearing a Bonus Mission!. After failing a Bonus Mission!. The spirit complimenting Yoshi on his skills at tilting the island. The spirit talking to Yoshi before the final battle. The Spirit Who Loves Surprises along with several other spirits during the ending cut-scene. This page was last edited on February 23, 2019, at 16:10.